Brad Stoltzfus, sophomore, bats for Goshen during a recent game. On Tuesday, the Goshen baseball team traveled to Crestwood, Illinois for a doubleheader against Roosevelt University. Goshen would drop the evening’s opening game 10-4 and despite a late Maple Leaf surge in game two, Roosevelt would rally to win again 4-3. Game one saw the teams trade runs back and forth early on, with Roosevelt holding a 4-2 lead after two innings. The Maple Leafs fought back to tie the game at four with runs in the fourth and fifth innings before the floodgates opened, as Roosevelt scored six unanswered runs in the fifth and sixth innings to win game one. Cody McCoy, sophomore, had a team-high two RBIs (runs batted in) for the Leafs, with Brad Stoltzfus, sophomore, adding another. Noah Shail, sophomore, Bryan Aponte, senior, Trent Lynn, first-year, and Preston Carr, junior, all scored runs for Goshen. Despite collecting nine hits in the contest, Goshen was unable to find that one hit to put them over the top as they left eight runners on base. Tyler Waslawski, sophomore, got the start on the mound for the Maple Leafs. The evening’s second game saw the offenses quiet down and pitching take over. Roosevelt would again score first, plating a pair of runs in the third before Goshen responded with two runs in the fifth and a run in the sixth to take a 3-2 lead into the bottom of the seventh. 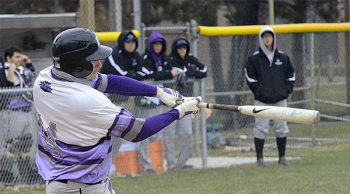 Carr singled home Shail and Connor Clemens, first-year, before Jesse Quintanilla, senior, brought Stoltzfus home on an RBI single to break the deadlock in the sixth. The Maple Leafs took the lead into the final inning and were an out away from earning a split in the doubleheader before a pair of two out RBI hits completed the rally for the Lakers, giving Roosevelt a 4-3 walk-off win. Goshen’s Travis Grimm, sophomore, shut the Lakers down, allowing two runs on four hits and striking out nine through six innings of work. Roosevelt’s Jared Jayne also had a good outing, limiting the Maple Leafs to three runs on four hits through seven innings. With the losses, Goshen’s record falls to 5-14 on the season. The Maple Leafs will have their home opener on Thursday the 17th in a doubleheader against Bethel College. First pitch is scheduled for 2:00 p.m.